With the exception of perhaps one or two years, I’ve spent each winter break of my life visiting my cousins in Charleston, but it wasn’t until this past winter that I was able to examine the city from the perspective of a student of urban planning and design. The designation of Charleston’s Broad Street in the APA’s “Planning Magazine” as a “Great Street” only fueled my desire to analyze the city from the inside rather than simply reading about it, and while I am generally impressed with the city’s ability to preserve its colonial identity and heritage, there are certainly a few aspects of the city that didn’t impressive me from a design standpoint as well as a few opportunities for the city to improve moving forward. Aesthetically, the city strikes a beautiful balance between uniformity and diversity, creating streets of buildings with similar height and setback but vastly different materials, coloring, and façade features. Along King Street, the city’s main shopping drag, nearly all buildings are between two to five stories tall and at uniform setbacks from the sidewalks, which are made of cobblestone or other colorful materials to make pedestrians feel as though they’re walking not down a street catering to the needs of our modern consumer culture but rather down an old road of the nation’s largest southern port city. A very nice touch indeed. King Street bends a bit near the southern tip of the peninsula, and although I assume this is due to a historical grid meeting the current one rather than a decision made by the city, I’ve always liked the idea of giving urban streets a bit of a slight bend at certain locations, for a few reasons. First off it gives the city more of an organic feel, offering pedestrians a break from the rigidity of an unaltered grid, and second of all it keeps the individual guessing as to what could be occurring beyond the bend, as opposed to in a completely straight street in which nothing is hidden. However, I am not a big fan of the (relatively) massive development that hugs the street’s bend, the Charleston Place Hotel. The façade of the hotel is actually very nice, built of dark brick with high-end shops on the ground floor, and it would be a lovely quaint hotel that would add to perhaps any other location. However, as mention, what makes King Street so fascinating is its ability to find a union between architectural unity and diversity, and this huge development unfortunately offers too much of the former and not nearly enough of the latter. Standing on King Street and looking down towards the bend, the eye would benefit much more from a continuing variety of small buildings of varying colors and textures, but is instead given a mammoth development which, in my opinion, doesn’t offer enough architectural diversity. However the balconies of the hotel offer great views of the street, so it’s clear that the development was built for the hotel patrons rather than the pedestrians. Shame. King Street, looking south. 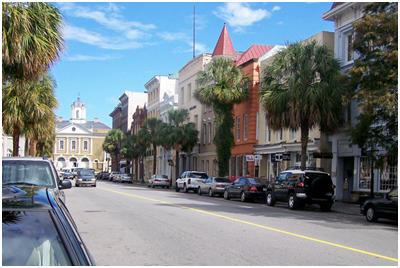 Charleston Place, at the end of the street on the left, doesn’t offer the architectural diversity that the buildings on the right do. As for Broad Street, the APA’s darling street in terms of historic preservation, it certainly lives up to its title—but does little else. Trust me, the street does a fantastic job of transporting you back in time and really gives you the feeling that you’re actually in colonial Charleston, with it’s beautiful old architecture and lanterns hinged on the buildings. However, that was really all that the street offered. Although I only visited during winter break, the street seemed far too wide for the cars travelling down it, and although there were a few cool old bars, there was little pedestrian activity. Even my cousins who had lived in the city their whole lives were surprised that Broad Street was named as one of the “Best Streets” rather than King. To me this seems like the APA trying to find one example of great historic preservation, and although good preservation can certainly enhance a city’s character, I’m really not too crazy about the idea of preservation simply for preservation’s sake, especially when it doesn’t really add much to the urban fabric. One thing that did surprise me about downtown was the lack of infrastructure for cyclists, a group of which I saw very little during my visit. After all, the young and active College of Charleston students reside all around the downtown area, the climate is beautiful, the air is clean and crisp, and the palmettos and waterfront areas offer cyclists beautiful scenery. 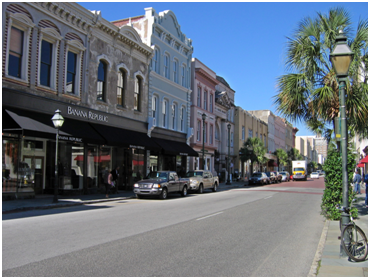 King Street is a three-lane, one-way street that moves traffic southbound towards the Atlantic. The rightmost lane is used for street parking, leaving the middle and left lane for auto traffic. However, the sidewalks are barely wide enough to accommodate pedestrian traffic and minimal tree coverage so it’s clear that no sidewalk space could be used for bike lanes, but I did notice that the automobile lanes on the street were quite wide. Since it’s usually more favorable to have bike lanes to the right of moving car traffic, perhaps two feet could be removed from each lane to accommodate for a four foot southbound bike lane in between the parking lane and the central traffic lane. The city already offers an old trolley system, so allowing for biking infrastructure would encourage much more multi-modal transit, something that Charleston could really use given its dense downtown, beautiful climate and scenic waterfronts. 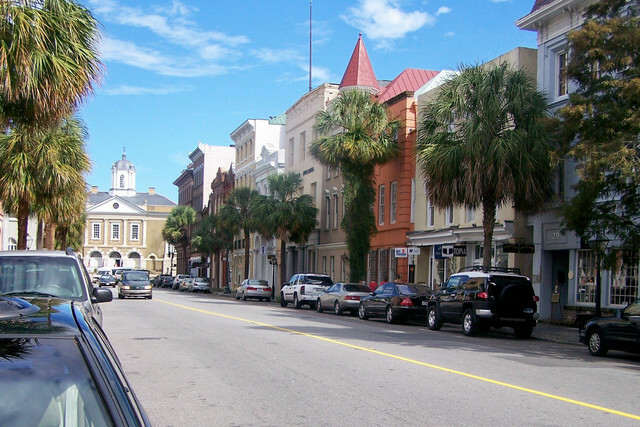 All in all, Charleston really does offer something that very few other American cities can. While it certainly isn’t the bustling metropolis that New York or Chicago is, true southern charm is alive and well all throughout the city, and you can feel it once you step onto the streets. 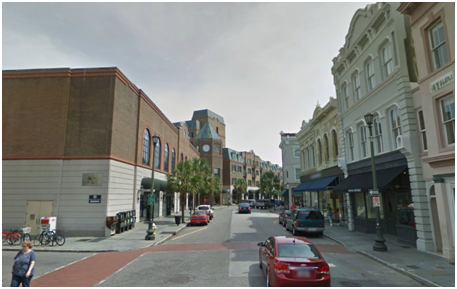 Aside from the minor improvements that I suggested above, Charleston truly is beautiful, and it really is a fascinating case study of a mid-sized city preserving its rich cultural history while adapting to modern challenges. If you’re ever given the opportunity to visit, don’t pass it up.